Happy Equinox to all! I just learned today that the length of day and night is not exactly 12 hours throughout the world (that’s equilux, different at every latitude). But metaphorically we can think of this day as a period of balance of light and dark, as the sun crosses the equator from north to south. While friends in Zimbabwe and Australia celebrate vernal equinox today, here in the US we’re celebrating the beginning of autumn. Both spring and fall are transitional seasons where winds kick up and life begins or ends for the year. I used to get sad to see autumn arrive because summer and its warmth and bounty were ending. In fact, some of my east coast friends still hate to hear the f-word (fall). Many years ago, my friend Steve, from Massachusetts, changed my mind about fall. He and many of his family celebrated birthdays in October, and he talked of crisp air, colorful leaves, deep blue skies and inner warmth. I realized I’d been missing the loveliness of fall while fearing snow and cold to come. Now I think of it as a time to pause and contemplate the change in light, the beauty of nature, and to appreciate our place in the yearly cycle. Autumn is the time of the last harvests. Here in California, as in many places in the US, tomatoes are still coming in strong until the frost. The very short fresh pinto bean season is here. There are still strawberries and raspberries, summer squash, and herbs like basil and dill. The iconic fall veggie, the pumpkin, is coming into season, but meanwhile its cousin the butternut squash is a delicious way to celebrate fall. 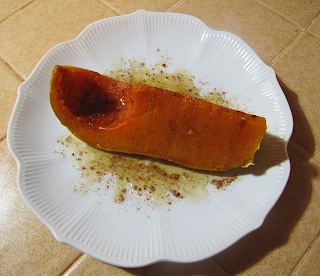 I used to bake squash with butter, brown sugar or maple syrup, and pumpkin pie spices, but the longer I cooked it, the dryer it got. Then I learned this method, which keeps the squash moist. You could say it’s oven-poached. Spices, sweeteners, and butter are added (or not) after it’s cooked. Once I tried this method, there was no going back to the old way. 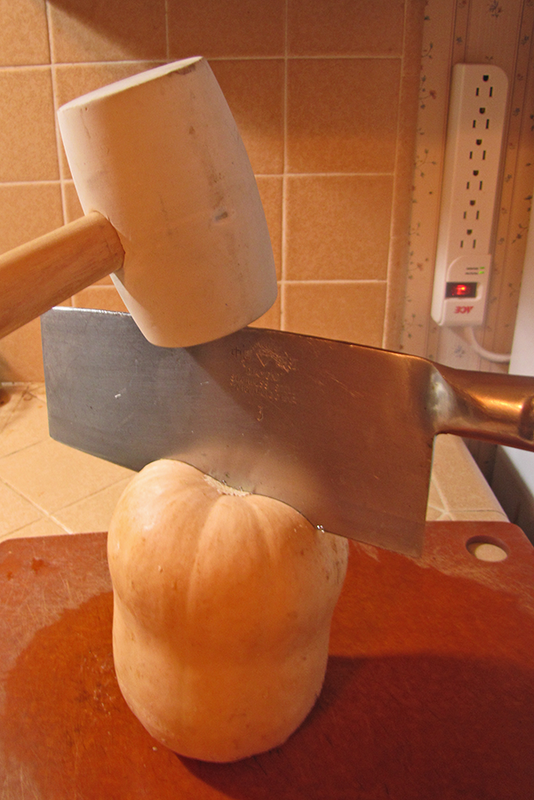 Cutting the squash is always challenging, and my husband perfected a “he-man” method that I now use too. It requires a heavy cleaver and a rubber mallet. Slice off the top stem end with cleaver to make a flat surface. Then set the squash with cut side down on a cutting board. 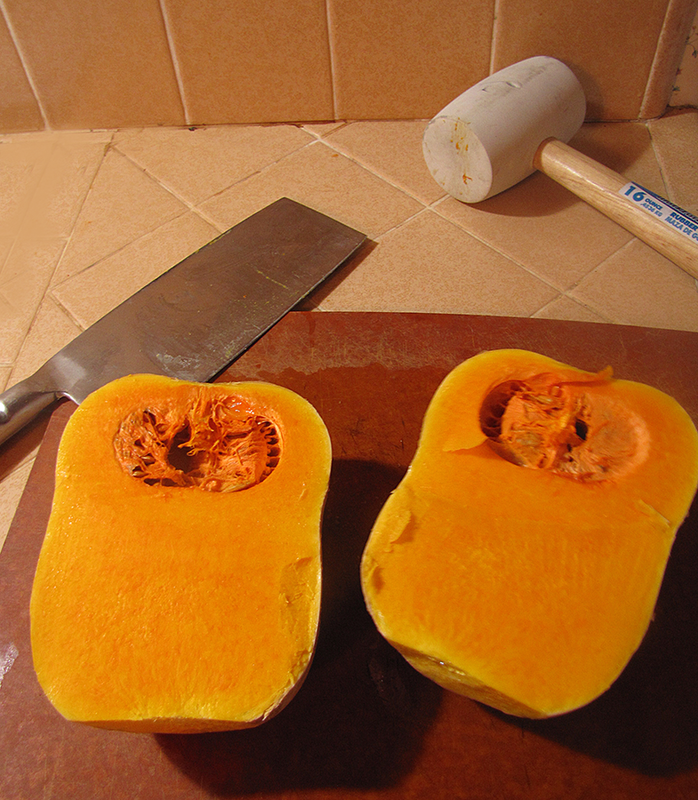 Make a cut at the bottom of the squash with the cleaver in the middle, to make two equal halves. Strike the cleaver lightly but firmly with the mallet to drive it in about a half inch. Now flip the squash onto its side and slide the cleaver down the middle of the side, to make two equal halves. Then hit the cleaver with the mallet until it’s all the way into the squash. Then take the cleaver (with squash attached) and hit it firmly once or twice on the cutting board—and make sure cutting board is on solid surface! The squash will break in half. It might take a few tries to perfect this method so halves are equal. Best wishes for a beautiful fall (or spring). Enjoy the season! Cut squash into two even halves using the hammer and cleaver method above, or any other way that works. Scoop out the seeds. They are delicious roasted in the oven, so save them if you’re so inclined (I’ll post a recipe soon). 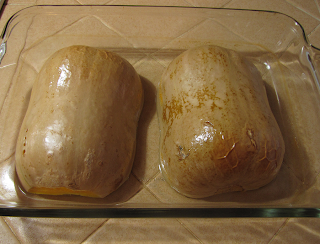 Place squash cut-side down in 8” x 11” baking pan (or whatever size pan is appropriate to your squash). Add about 1 inch of water. Place pan in preheated oven and bake about 1 hour, till fork can be inserted easily. If you like your squash softer, it can be baked longer, up to two hours. The skin will brown as the insides get soft. Do check the water level after one hour and top up if necessary. Cut into individual slices. Put maple syrup or brown sugar, butter, and pumpkin pie spice or cinnamon and nutmeg on the table and let each diner serve themselves and spice their squash to their liking.